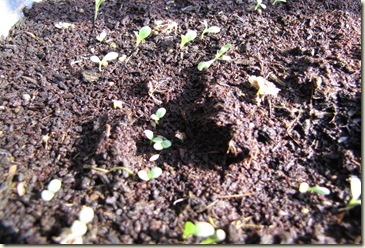 Earlier I wrote about Seed starting Lettuce with many pictures of various steps involved. I couldn’t blog about the results actually. Anyway, it took almost 2 weeks for 50% of the lettuce to show up and the rest of the 50% never really showed up. I was really disappointed. I started questioning the way I started those seeds and did some tests by starting them in different ways. 1. Tried soaking them in water for few hours, a day. 2. Put them in moist tissue paper towel to see if i have luck there.. still the attempts were futile. The seeds were supposed to be “imported” and it didn’t expire either. So what went wrong?. While I was thinking just that, one of my friend gave me some seeds from France. I immediately sowed them the same way I mentioned in my post. This time my expectation was low. After just 1.5 days I saw one of the seeds throwing out white small roots.. Wow. this is like Magic. The seeds were fresh and they germinated in no time. Many sources in the internet mention that the age of Lettuce seed is 2 years. In those 50% seeds that germinated in my first batch, I let a few of them to flower. Lettuces were not very happy with Bangalore’s weather(they need much cooler temperatures around 20 C) and it was much hotter.They were happy to flower. When a plant is stressed, it starts to flower. It is very interesting actually. Plant thinks that it cannot live longer in that environment and prepares to continue its generation by flowering and seeding much quicker. Lettuce is no different in hot climates. It bolts quickly. 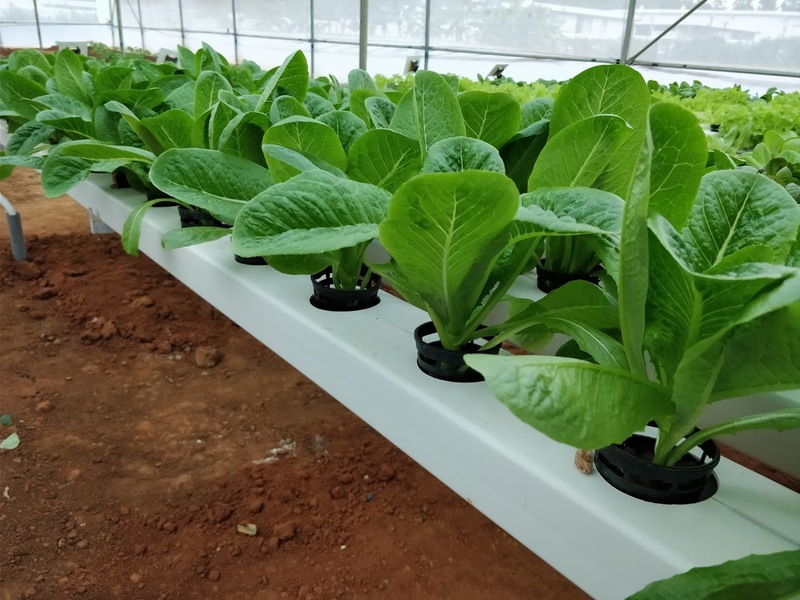 Here in this post I will mention about saving lettuce seeds. Though it is advised not to save seeds from plants that flower prematurely.Vigorous plants should be selected and allowed to flower. The process of seed saving remains the same. Find a lettuce plant that is strong and vigorous and let it flower. In my case, the plant volunteered. The young flower that has just bloomed looked yellow in color for the variety I had. 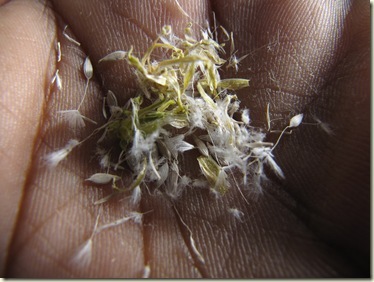 Once the flower matures, the seeds are formed. 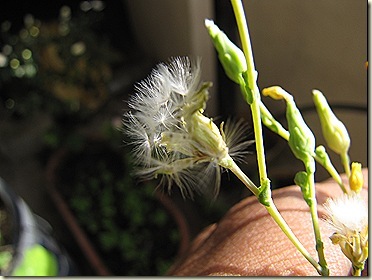 The seeds have a parachute like wing that helps it to fly. You can see that in the pic below. You can wait for the time where most of the flowers are burst open like the one above but not fallen off the plant, and then take the whole stalk of flower and collect individual flowers and separate the seeds out of them. And guess what, they germinated in two days!. 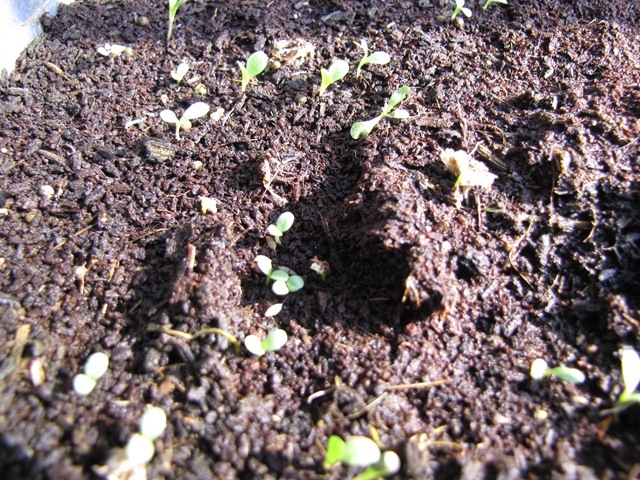 Below is randomly sown lettuce seeds peeping in just two days!. Another reason why you should save your own seeds!. There is nothing wrong with saving seeds from a plant that prematurely flowered or bolted. The seeds will germinate like any other seed. 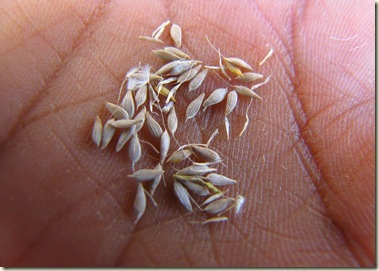 However, the vigor could be less or seeds quality might not be good.It is not advised for commercial seed savers. 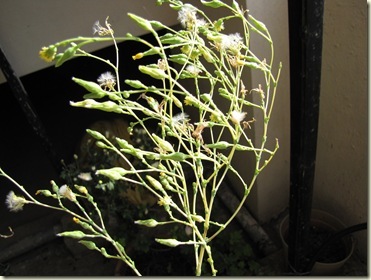 Like I mentioned in the post, I am using the seeds that I collect daily from one of my bolted plant. They germinate quite well and for my home container garden its just fine!. Go on! Save seeds and enjoy!. Thanks, then I will try them… I have also left another plan or two to flower, but with the cold weather thet we have, Im not sure it will flower. I have 2 rose plants in my balcony. Need some tips for Roses. Which is the best Rose feed ? Where can I get it in bangalore (south)? How often should these plants fed and in which quantity? Again, thanks much for coriander tips.. I think, I ll buy new seeds in this weekend and will try with them. Roses love one thing.. sunlight it is. Good amount of sunlight. My rose plants perform so well after I moved them to a spot that gets direct sunlight atleast 6 hours of sunlight. And for the feed, there are some rose mixes available from Nitroplex. I had mixed results. You can use bone meal (along with compost) a spoon or two around the plant. Mix the top soil with bone meal. This can be done once every 15 days. Also, epsom salts (Magnesium sulfate) will help. If we use epsom salts, around a teaspoon per plant. This will throw many basal canes and in turn result in more blooms and a stronger plant. You can check out http://geekgardener.in/2008/03/12/say-hello-to-first-timers/ and http://geekgardener.in/2008/04/02/basal-canespics/. 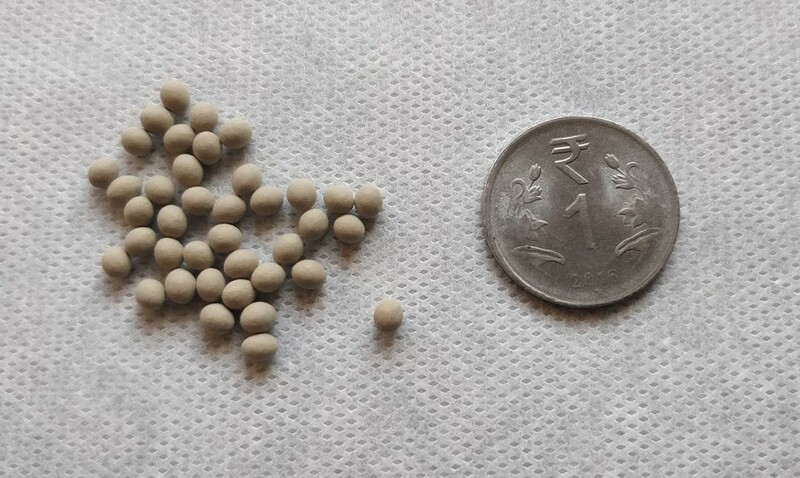 Hi GG, the seed saving series is very helpful. Will try saving seeds this way. I’ve tried saving seeds from Brinjal and tomatoes and they give very nice results esp when sown fresh. I have tried and have had great results with seeds from flowering plants (of course all plants bloom, DUH, but you get the catch…) but veggies? your posts are really informative when it comes to veggies… Thanks a ton! I Bought one rose sapling. After 3 days transplanted it in a big pot.Then after 4 days kept in direct sunlight in the terrace and watered it everey morning.After 4 days the leaves became lifeless and the plant died. I want to know if it died due to over heat and at what time it should be exposed to sunlight. Hi, I have failed in getting my lettuce seeds to germinate. Not sure what I have done wrong. I wondered how did your lettuce doing after the germination? 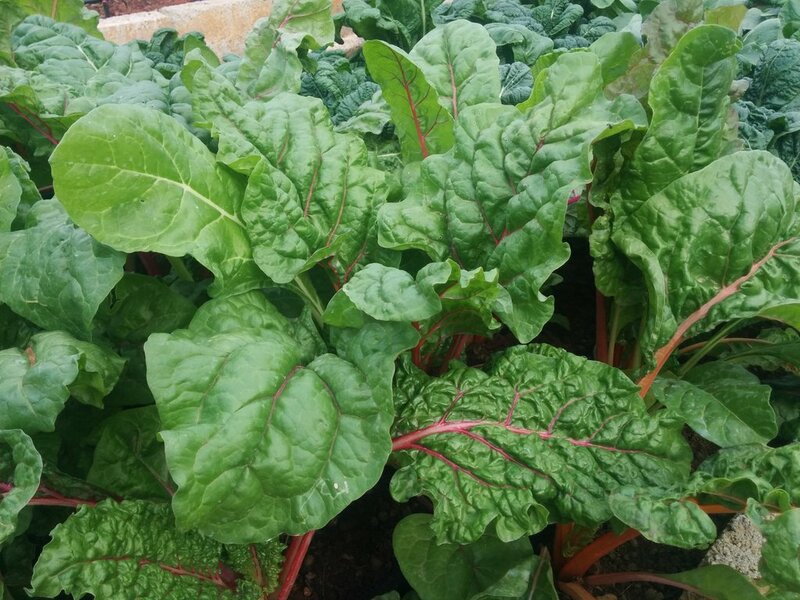 Is there anywhere in your blog where I can see your lettuces? Thanks. I enjoy reading your informative blog. You seem like a seasoned gardener and you are very generous in the sharing of your knowledge. I will post some pics of grown lettuces soon. They did so well after germination that I had to share some of the yield. I also saved the seeds from the first batch of lettuce I grew. Explains why my lettuce started flowering so quickly (We got to harvest it twice – salad for two, i.e., :-)) – not sure if we will get more. I was wondering why would saved seeds germinate faster than the original ones that you had? When we cut the leaf out milky liquid comes out – have you seen the same thing? About the roses: I seem to remember a post by Raman on your blog about how he uses oil cakes. I could not locate that post again. 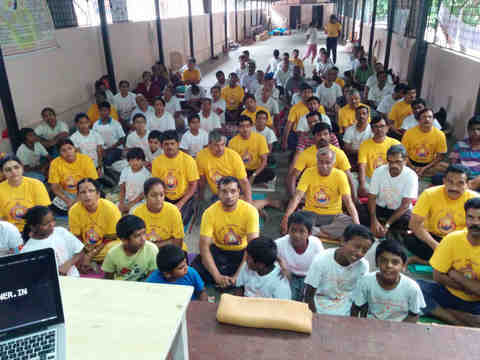 Can you share the link for the same? Thanks. Lettuce seeds don’t store well for long. It is essential that we use fresh seeds. It is why fresh seeds germinate on time and older seeds take time. 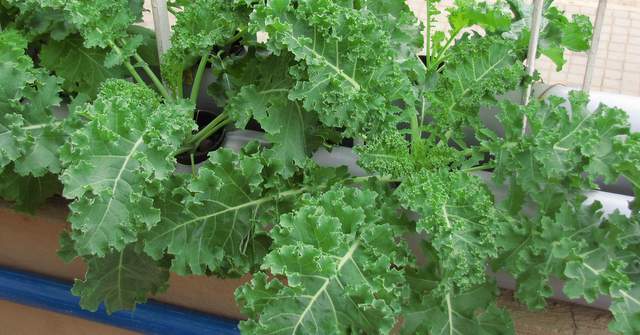 Also if the temperature is high, lettuce seeds become dormant which can be temporary or permanent. The milk coming out of the leaves is totally normal. The name “Lactuca” is because of the milky liquid that comes out. Sorry I delayed giving this link.